This was a game we should have won but ended up having a 4:4 draw. It was a tough game where we had a number of unsuccessful shots at goal and lapses in our defence that allowed the opposition to score against us. A mention must go to Maddie Rist who was run ragged and well-marked in the mid-field but still managed to free the ball to the strikers. Players of the Day were Rory Brabant for his tenacious defence and not giving up, and Mia Clark for being in position and taking on the role as striker. 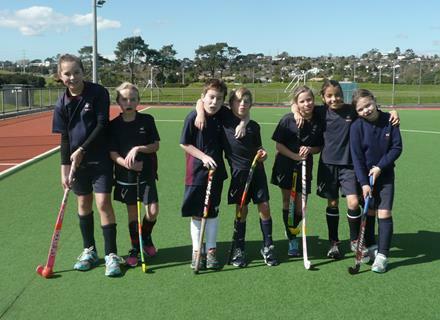 Our Years 5/6 hockey players have been training together for a few weeks now but on Thursday they faced their first competitive matches as they participated in the Inter-schools Hockey Tournament at North Harbour Stadium, Albany. Drawn in the extremely tough Boys A League, our team faced a demanding challenge but every single player rose to it, displaying skill and determination at every stage. With each game, our team grew stronger and, by the end of the tournament, were truly a force to be reckoned with. Fierce attacks and lightning breaks for goal were witnessed time and again as our players battled for control of the ball. Our defensive line stood strong against all opposition, intercepting numerous attempts on our goal. We were unfortunate in having goals disallowed in a couple of games, as they had been struck from outside the scoring zone. Although our team did not make the semi-finals in their league, they put in an amazing and dedicated performance and should be proud of themselves. It was a pleasure to watch them play and develop as a team. Wentworth Hockey Squad: Raphael Day, Austin McAlpine, Maddie Rist, Charlotte Sancto-Jones, Teresa Sell, Bridie Smith and Emily Treble. This was another tough game which saw Wentworth take a 5v4 win. The players dug deep and played as a team. The defence was excellent and they ganged up on the oppositions strikers causing them to take long shots at goal. Our strikers communicated well and were able to create gaps which allowed them to shoot at goal. Player of the Day was Maddie Rist for outstanding positional play and passing from the midfield. The other player of the day was Charlotte Sancto-Jones for her superb goal keeping and throwing. What an exciting game! Teamwork was abundant with passing, defence and communcation up and down the court. The final score, 3-3, shows the competition was fierce. Player of the Day goes to Ben Rist who finished the game with a beautiful basket but it was beaten by the buzzer!! Great work team! We lost. Even though we always turn up on the court to win, today was just not our day. It is always disappointing to lose a game, yet each loss provides us with the opportunity to learn something new about our own game. This week we discovered that we need to throw the ball to someone close to us rather than lob the ball over the heads of our opposition. We found out that we need to work on our fitness to make sure we can defensively compete against the other team as they run towards their goal. All of these lessons are useful but the MOST important message we took away from this game was the value of perseverance. In life we may face opposition that is clearly better than us…what do we do? We keep going. We support each other. We do the best we can on the day. We hold our heads up high. We play with pride and we lose with dignity. Comets this week you did that! I was proud of each of you. I watched some of you play with injuries – even though you didn’t want to. I saw a team of friends work hard on court to support each other. Most importantly I saw you high five the other team and say “Good Game”. To me, your attitude makes you WINNERS. Our Player of the Day demonstrated all of the qualities of a winner. Rory Brabant played hard, but fair. He ran up and down the court trying to stop every ball that came near him. Rory NEVER gave up! Well done Rory. See you all on Sunday when we work on some of the lessons the great team Whanga Thunder taught us this week. It was an extremely tough game for the Hornets last week as they took on the Red Beach Stars. As ever, our team displayed skill and determination, putting in an energetic performance but it was not to be their night. Despite their best efforts, the Hornets could not break through the Stars’ defence, finishing the game with only a few points. It was a Team of the Day award rather than a Player of the Day for the Hornets to reflect the effort and energy that each player had contributed throughout the entire match. Wow Wentworth Warriors! What a great game to watch. We had a fantastic gameThursday night and won 19-3 against the Orewa Primary Kingfishers. Kiera Jordan was a fast mover, and Charlotte Sancto-Jones once again proved that she is a player of many talents, moving effortlessly from one position to another. Both Emily Treble and Rosie Li showed great skill in passing and catching, and Mia Clark made some brilliant intercepts. Rosa Clark never gave up and, once again, Bridie Smith and Maddie Rist made a wonderful team. Player of the Day went to Maddie Rist who was our ace shooter. Well done, Maddie! What a fantastic game the Wentworth Warriors had this week! We played the Stanmore Force and won 12-0. It was great to have Rosie Li playing for us again; she made a huge difference with some confident passes. Kiera ran and ran and never gave up, popping up wherever she was needed, and Charlotte once again was a very valuable player with good, strong throws. It is great to see how the whole team is working together really well. Mia kept her eye on the ball and made some great intercepts, and Maddie and Rosa worked together to set up some wonderful goals. Rosa was the player of the day. Our Y5/6 Hornets were simply amazing last week! Faced with yet another tough team who beat them last term, they knew they were up against it from the start of the match and would need their best game. At half-time, the scores were level at 6:6, reflecting the determination of both teams. However it was the Hornets that soared in the second half with strong attack and defence from all players. The Orewa North Seagulls were prevented from adding to their score but the Hornets took control of the game, passing the ball down the court and through the hoop to finish victorious with a super score of 12:6. Player of the Day was Joshua Hill for all-round excellence. Well done, Team! Oh what a game! This week the Comets took on Whanga Bolts and my oh my, it was an exciting outing! Some excellent long range goals and impressive committed defence enabled the Comets to fight until the final second of the game. Unfortunately time ran out for our team this week, with the scoreboard showing the Comets behind Whanga Bolts by only one point at the final whistle. Player of the Day went to Emily McLeish for her ability to hold tightly onto the ball providing us with a couple of great jump ball opportunities, and for making a fabulous steal. Well done Emily. See you all on Sunday morning at training. It was a hard fought win by our Flippaball team, with signs that a very good team is beginning to develop. It was pleasing to see our defensive players marking their opposition and restricting their goal shooting opportunities. The strikers communicated well and used the open space effectively to draw out defenders. We missed a number of shots at goal which would have seen our 6-4 win look very flattering. Players of the Day were Liam Phillipps for great defensive play and stopping certain goals, and Bridie Smith for good positional play and goal shooting. It took the Wentworth netballers a bit of time to get into the groove this week after last week’s cancellation. There was some fantastic teamwork between Bridie and Maddie, and Charlotte put up a great fight in Goal Shoot, a position she hadn’t played in before. The Whangaparaoa Dolphins were formidable opponents, having very good moves and a tall team and they won 9-3. We’ll beat them next time, Wentworth! Player of the day this week went to Emily Li for her wonderful defence and ball handling skills. Well done, Emily. We have started Term 3 with the grading games and it was a tough call for the Wentworth Hornets last Tuesday, as they were up against The Blue Knights – a rep team! The Knights dominated the first half of the match but all credit to our players, who regrouped at half time and came out fighting – even managing to score a few hoops along the way. It was a brave and determined battle by the Hornets, with Maddie Rist named Player of the Day for her ceaseless energy throughout the entire game. lfull attack, leaping jump balls, impressive long shots and full court team play ensured that the Asteroids came out on top of the leader board in Thursday evenings game. The Stanmore Bay Stingrays, a new team, certainly stepped on court to play yet the Asteroids experience shone out with the scoreboard ticking over 12 - 1. Every member of the Asteroids team played with determination and grit. This team continue to prove that they are in it to win it and as sideline spectators, we look forward to an exciting term of miniball from this slick outfit. Thank you to Jared Davies and Rory Brabant for stepping in as reserves in this game. Player of the Day went to Atia Houseman for demonstrating dogged, tireless and persistent defence. Well done Atia - keep it up! Welcome back to another exciting term of miniball and we also welcome Rosie our newest team member! Our Comets were keen to step out onto the court on Thursday afternoon and face the formidable Red Beach Rockets. Initially these two intergalactic giants fought hard to beat the first game nerves but once they settled into their rhythm the Comets showed excellent team play, demonstrating some slick bounce passes and smothering defensive combinations. Unfortunately game one fatigue set in for our Comets late in the second half and it was the Rockets who capitalised by gaining some impressive baskets. During training we will work on our passing to ensure we are able to execute strong and accurate passes. We will also focus on dribbling away from our opposition so we are in a better position to make these passes reach our team. Player of the day went to Rory Brabant whose tenacious defense and fast attacking play was invaluable! Well done Rory.